Travel with us on the Backroads using our lens of imagination! Life at 45 miles per hour has a way of making one feel like they are on an endless vacation. The Bluemoonistic Team lives close enough to the BRP to hop on it any time we want and experience life at a slower pace. We never cease to wonder at how all 469 miles of beauty through the North Carolina and Virginia mountains came to be. It connects the Shenandoah National Park to the Great Smoky Mountain National Park. Love this quote! That’s exactly what they did too! Think about it – no maps, weather conditions we can’t even imagine today, mountain folks unhappy with the intrusion into their world, ruts rather than roads, rocks of all sizes to conquer, unfriendly wildlife – and the list goes on! It was truly a monumental task! But the Great Depression left engineers, landscape architectures and hundreds of mountain folks in poverty. This golden opportunity offered by President Franklin D. Roosevelt gave them all the chance to achieve something thought never possible! The Bluemoonistic Team has traveled the entire 469 miles of what is known as “America’s Favorite Drive”! The lowest point along the Blue Ridge Parkway is where you cross the James River in Virginia at Milepost 65.6 elevation 670 ft and the highest point is just south of Waynesville, NC near Mount Pisgah at Milepost 431.4 elevation 6053 ft. Everything in between has so many wonderful views, hikes and natural beauty that it would be impossible to list them all here. We recommend that you go to Blue Ridge Parkway Interactive map and check out all the possibilities available. Life at 45 miles per hour has many advantages for a photographic team and we would like to share some of our favorites. We are continually finding new hikes and areas to photograph! The BRP has beauty during every season of the year and during every type of weather. The natural beauty of the mountains is enhanced by these many changes not to mention the varieties of flora, fauna and wildlife that you can see during your travels. 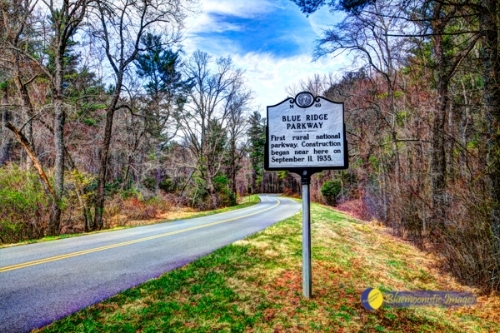 There is another aspect of the Blue Ridge Parkway that many folks may not be aware of and that is the history that one will learn along the way! Because it is a part of the National Park Service it offers information to the public about the natural and cultural history of the Appalachian Mountains. There are wonderful interpretive programs up and down the BRP that offer programs for children and adults alike. We feel like we have only scratched the surface of learning about our beloved mountains and use every opportunity to take photos that take us back in time and teach us how important preservation is to our future. Here are just a few of the historical mountain homes that remain today! The Blue Ridge Parkway offers so much that it is indeed an “endless vacation”. Try different sections, during different seasons – you can get on and off the parkway easily at your own convenience and feel like you are on your own special tour every time! There are many towns directly off the BRP that support the experience. Civilization and places to eat and shop are always close at hand during your journey. Remember many of these communities depend on tourists that travel on the BRP. Visitors to the BRP in 2016 spent $979 million in the communities near the BRP. Stop and think about what an economic impact on these communities that is! If you are lucky enough to have the BRP travel through your area then be sure to promote the country stores and restaurants that make the experience even better. For those of you who love cruising on your Motorcycle, the Blue Ridge Park is your place to be! Whether you want a Sunday ride or travel the entire BRP, we recommend you try a website called Blue Ridge Motorcycling. During good weather you often see more motorcycles on the BRP than cars. We have talked to bikers from almost every state during our travels. The BRP has a way of bringing people together! We want to leave all our photographic fans with this thought – Although the BRP was created as a government project, the National Parks are receiving less funds every year for upkeep and new projects. As sad as it is, they depend more and more on private funding. We urge you to support whatever private organization you feel can help the most to preserve this national treasure for future generations. Life at 45 miles per hour in this day of faster speeds for everything is something worth preserving. Try it, we promise you will not be disappointed. The experience can make your life just a little bit better!